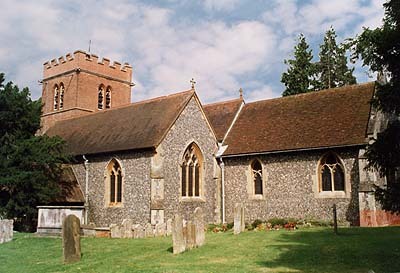 Hurst has a big parish church opposite Barker's Almshouses and the Castle Inn. It was personally dedicated by St. Osmund. The present building has a notable tower of Berkshire Brick with nice gargoyles. The churchyard is full of large chest tombs to the Simonds family who founded the famous Brewery and the Bank in nearby Reading. Inside, the rood screen of Henry VII's reign is a rare survival in Berkshire, though it has been much reworked and bears the arms of the Stuart Kings. Archbishop William Laud (who was born in Reading) preached from the late Elizabethan pulpit in 1625 whilst visiting friends at Haines Hill House. The delightful hourglass and stand of 1636 would have stopped such sermons going on too long. There is a good set of effigial monuments and brasses to the local gentry. Note Alice Harrison who is shown in the large four-poster bed where she died in childbirth and Henry Barker's fine figure of death with his hourglass. Lady Savile's monument is huge and very theatrical, depicting most of her family. Architecture: Mostly Victorian restoration with a brick Tower of 1612, though there are many surviving Norman and 13th & 14th century features.